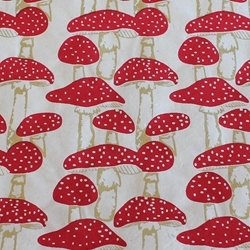 Contemporary colors and designs jump off the page with screenprinted Lokta origami paper featuring a field of mushrooms with metallic gold stems and a red top on a natural paper. Nepalese paper artisans hand-craft Lokta paper out of fibers from the bark of the Lokta bush and then silkscreen eye-catching designs onto the sheet. Inspired by nature, the Mushroom design features a garden of whimsical mushrooms in metallic gold and red on an eco-friendly, cream colored base of this hand-made Nepalese Lokta Origami Paper. Lokta Paper is a strong, durable and eco-friendly paper hand made from the fiber of the "Nepal Paper Plant," also called the Daphne Shrub or Lokta Bush. The pulp fibers are long and flexible providing exceptional strength while maintaining its light weight. This paper features subtle fiber inclusions, adding natural beauty to whatever you create with it. Lokta Papers are acid-free and weigh approximately 45 to 60 gsm for a moderate weight. The handmade paper lends itself to a multitude of art, craft and home décor applications. Available Sizes: 6" x 6" and 9" x 9"